Bookmarks are the best promotional tools for any brand. Not only can they be beautiful, they are very practical. No wonder they’re kept around for years. There when it's needed – It's the first and last thing someone sees when they open and close a book. Right time – Your brand can be seen when your target customer is at their most relaxed state. People usually read books while traveling or at home right before they go to bed. Exposing your brand when they're least distracted makes perfect sense. Practical and useful – Unlike some marketing materials, bookmarks actually serve a purpose. People rarely throw them away. We have two types of bookmarks to choose from. Choose from standard and silk bookmarks. 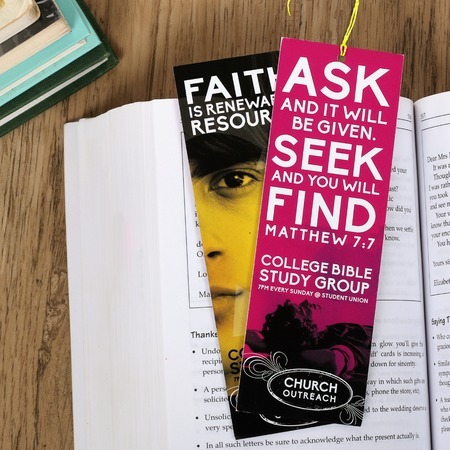 Standard bookmarks are printed on traditional cardstock and come with your choice of coating and more options including custom size. Silk bookmarks are smooth and luxurious to the touch. They are water and tear-resistant and come with a spot UV option so you can highlight key areas of your design like logos and calls-to-action. All our bookmarks can have hole drilling. That way you’ll be able to add strings or ribbons if you’d like. Note: Strings or ribbons are not included.